Scott has written extensively about Ilhan Omar, who has received much favorable publicity as the first Somali-American to be elected to a state legislature, notwithstanding the fact that she appears to have committed bigamy and immigration fraud, a subject on which she refuses to answer questions. Because of her minority status–and, frankly, her exceptionally good looks–she has achieved national renown in a very short time. Omar surely knew that the poster was a fake, yet she pretends it is real. 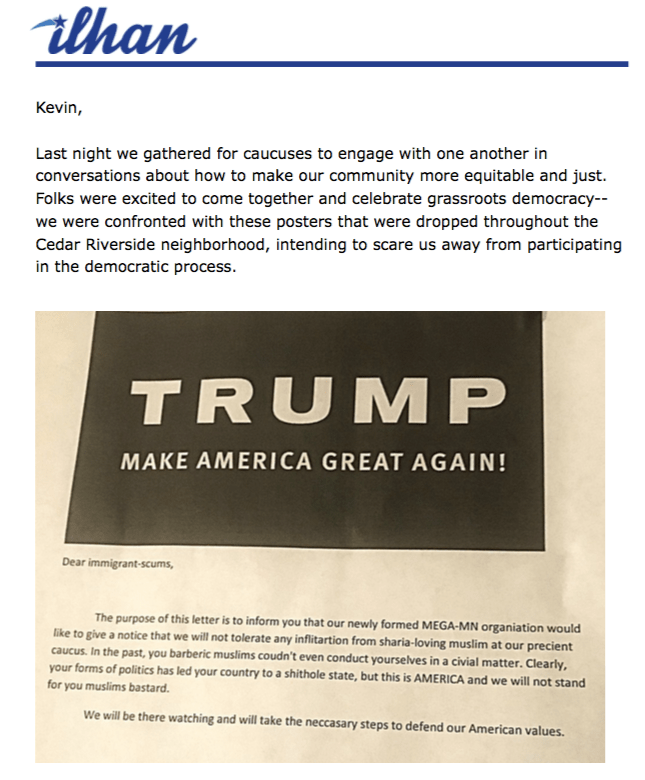 The subject of her email is, “Help us defeat Trumpism in our neighborhood,” and she claims that these fraudulent posters “intend[ed] to scare us away from participating in the democratic process.” What’s the point? Fundraising. 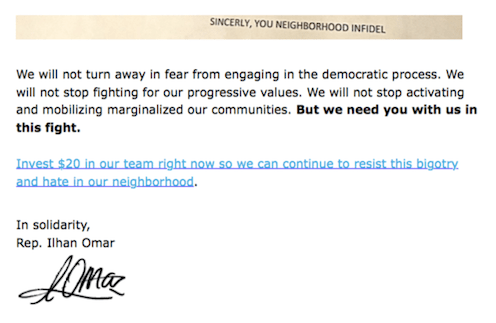 Invest $20 in our team right now so we can continue to resist this bigotry and hate in our neighborhood. Actually, the only bigotry and hate in this story comes from Ilhan Omar and her supporters. It is enough to make you wonder who actually created the posters.